A long title, and a short post to wish you a Pesach Sameach!! As the Blossoms turn to spring green, reflected in a Tambourine!! Time to change the header to "Matzah and Cherry Blossoms"!! The singers go before, the musicians last, between maidens beating tambourines. Passover Post-cards as the blossoms give way to new green! H A P P Y P A S S O V E R ! Timbrels and Matzah , O my! as if it was out of a movie scene. And then the doorbell rings again. Shabbat Shalom!! the last Shabbat before Passover! The Great Shabbat (this Shabbat is called Shabbat Gadol! the Great Shabbat)~~~!! 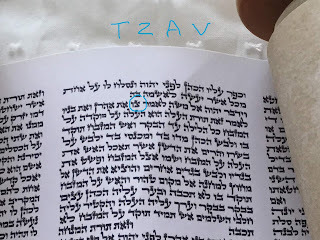 Notice: This Post may contain photos and scriptures to follow, for now just posting a few words in the excitement of receiving the Matzah and the timbrels!! You may be able to guess the two scriptures I have in mind!! (OK, if anyone is up for the challenge, and gets them, then a tambourine is in store for you!)!! 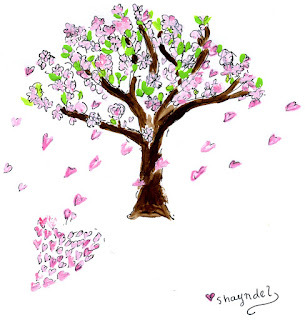 Blessings and Love, Shayndel, off to clean my cabinets! Today I am His bride. He said the words "I forgive you." for the things of the past. He has already forgiven. He said it's done. I'm forgiven. He has done it. Through His once and once only sacrifice of Himself. like The Bridegroom, Yeshua. There is no other One. wedding day will be only His Father knows. when everything begins a new. Receive His bouquets of blossoms. I said I will prepare the bread, beloved. This time, the guests will partake with You. All rejoice in the new month of Rosh Chodesh Nisan. 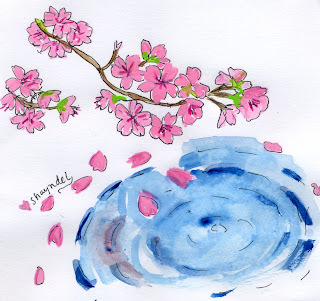 notes on this post: I was so excited today's Shabbat was Nisan 1~ !! The first day of the first month , the month of springtime on God's Calendar. Passover is on the 14th day of Nisan. 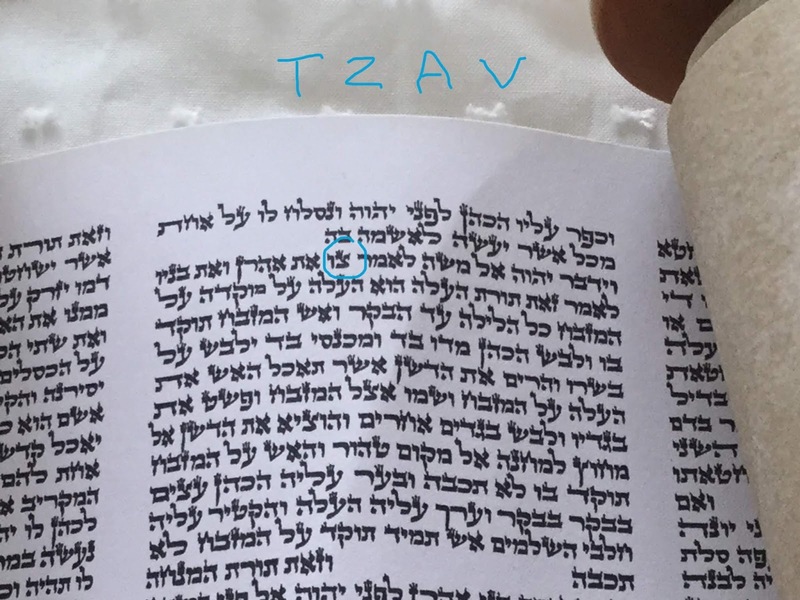 This is writing that just came from my reflections in the morning of Nisan 1, from a personal conversation with Yeshua and my excitement for the first day of Nisan. 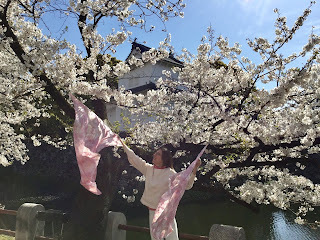 I have written posts that are more "explanatory" about Nisan if you would like to read more about this month on this blog please see here! bow down to the LORD, majestic in holiness. Blessed are You, Lord our God, King of the universe, Who brings on evenings with His word, opens gates with wisdom, alters time periods with understanding, changes the seasons, and orders the stars in their heavenly constellations as He wills. He creates day and night, removing light before darkness and darkness before light. He causes day to pass and brings night, and separates between day and night--ADONAI Tz'vaot, is His Name. May the living and enduring God continuously reign over us, for all eternity. Blessed are You, LORD our God, who brings on evenings. ---evening prayer, Maariv, from the Art Scroll Siddur "Blessings of the Shema"
Blessed evening and morning to all, bless the LORD who brings on mornings and evenings with His word. Blossoms and Birthday in the Spirit! Therefore if anyone is in Messiah, he is a new creation. The old things have passed away; behold, all things have become new. This year my "spiritual" birthday came in full blossoms!! Today is my born-again birthday!! Five years in Messiah Yeshua!! Walking out amidst the blossoms that speak of re-birth I looked up to heaven in thanks for the re-birth in my Messiah!! Breezing past bunches of blossoms seen from the bus, I breathed in the day. This year my spiritual birthday also came on the day of the spring recital!! I was in a recital of students age 5 to age 75 for the voice training lessons I take!! Three years ago, I started taking voice training because of back problems. After finding out I would need to strengthen the muscles around the spine to avoid further problems, I started taking voice training!! It became not only a way of healing my back, it has opened a new door to sing songs of Praise to my maker!! And share and minister His heart to others through the songs!! 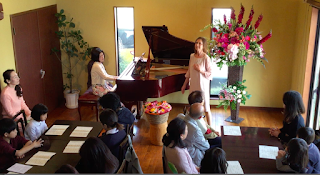 As well as get to know and grow with a wonderful teacher, who is also my friend, and be part of the spring recital and continuing learning...and healing! Thank you Yeshua! 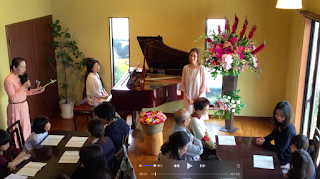 Blossoms and song, a family atmosphere and listening to others share their gifts was a beautiful gift to me as well!! I never imagined I would be singing in front of people, and the thought of being "good" or not didn't even cross my mind. Its funny as I am not a "singer", but I know it is a gift from God to do this voice training, and if He wants us to share something, then its something we will be delighted to share!! You must be born again I tell you!! That is what Yeshua, Jesus, says! Thy Kingdom come, on earth as it is in Heaven! 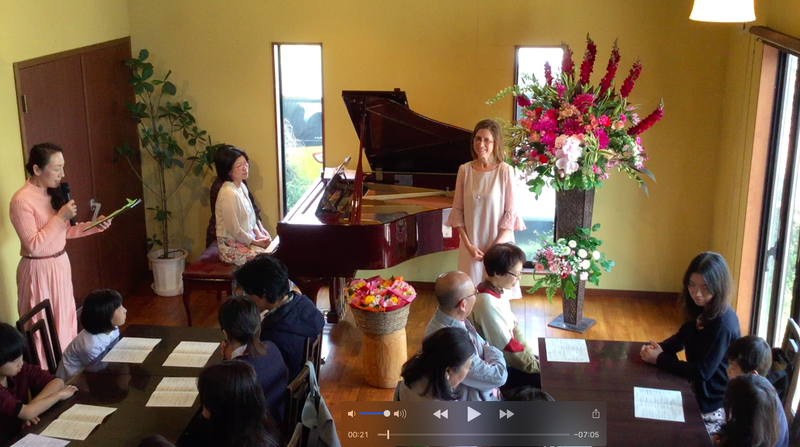 The youngest student performer in the recital today was 5 years old! I think now, that is the same age as my years since being born anew!! We can be 5 again, through being born in the spirit!! We must be born again, says Yeshua!! And for a gift for you, here is the song I sang---it is a beautiful song by Misha and Marty Goetz called "The Plans I Have for You", that they wrote together based on the scripture of Hope that many of you are familiar with from Jeremiah 29:11. As in Japan a new year starts in April, after the cherry blossoms, it seemed like a fitting song to sing when many of the students would be graduating and going into a new school year. I translated part of it with the help of my teacher in Japanese, so we added some verses in Japanese so those listening could understand the words!! It will be a little while still and a few more years training until I share my singing here!!! Please stay tuned with patience! Meanwhile, I will share the anointed singing by Marty and Misha, from Jerusalem! !Its a beautiful song, and a beautiful backdrop, please enjoy it HERE!! With a message of hope for all. Everything is bathed in its fragrance. 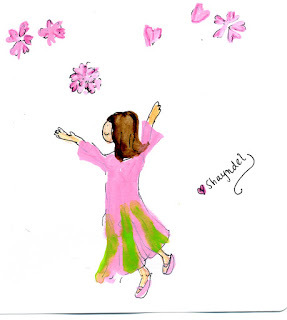 You'll want to look up towards heaven, as the blossoms open first one by one, and then all at once!! A smaller "half" portion of Challah this week, like the "half shekel" we are one half of a whole, made complete in God. 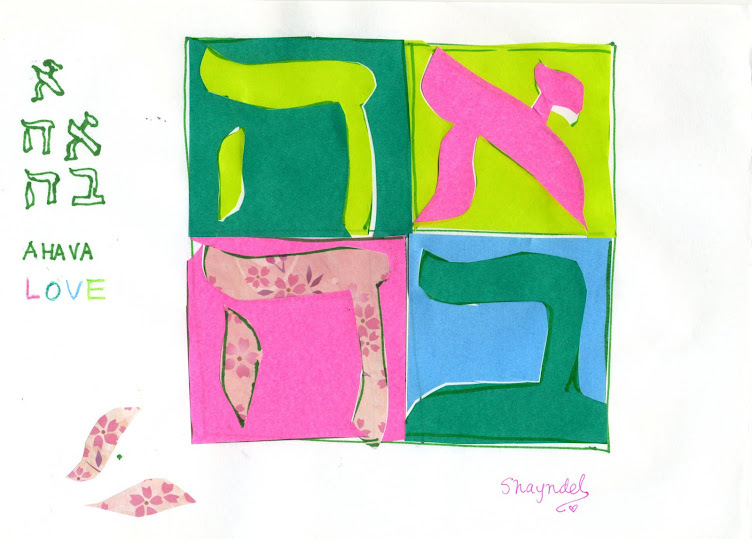 I became excited about making it and felt His presence with me as I shaped four Hebrew letters that spell "Todah" from the three strands. Once they were shaped and arranged on the trays to bake, I held them up towards Heaven. Thank you in Hebrew is the word "Todah", spelled in four Hebrew letters from right to left--tav..vav, dalet, hay. The voice of the beloved speaks to each of us in a unique way as we seek Him. 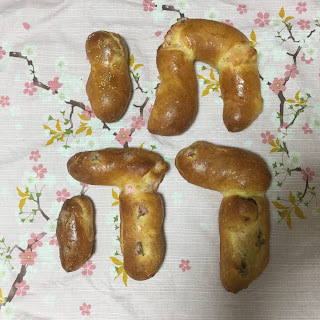 This week the Challah itself took the form of a Word!! It is the word "Thank you" in Hebrew!!! Which is pronounced, "Todah". You will notice this word in many of the scriptures that speak of Thanksgiving and Praise. "Todah" means "Thank you" and is an offering of praise in Hebrew. When baked, the second letter , the "Vav" became a little too short, so the actual balance of the word is a little off, but you can see there is basically how the word "Todah" looks in Hebrew, in Challah! On every Shabbat, we say the blessings giving thanks for the bread and wine and break bread in remembrance of Yeshua. We thank God for He creates the bread from the earth. We thank God for Yeshua, who is the Bread of Life, whose body was pierced and broken for us. In a moment when we broke the bread, both my daughter and I reached for the second letter, the "Vav". We broke it and ate the bread and drank the wine (grape juice) in remebrance of Yeshua who gave His life for us. I realized then that the "vav" that we just broke off also has a particular meaning, one of which is "connection". Yeshua is the connector between Heaven and Earth. And only through Him can we reach the Father. As we ate the bread, we could feel His presence. the Holy Spirit revealed another word for me to spell out!! I did as He showed me, and re-arranged the remaining letters, and voila! This word is "Dodi". It means "Beloved". Ani le dodi, le dodi Li. Our Challah of Thanks revealed the Beloved!! Or rather, He revealed Himself to us through the Challah of thanks!! It was a special Shabbat! This past Shabbat we read in the Parsha Tzav, which speaks of Thanks offerings and that is what inspired the Thanks TODAH challah !! Blessings and Shavu'a Tov. Have a blessed week!